"Where's the beef?" is a catchphrase in the United States and Canada. The phrase originated as a slogan for the fast food chain Wendy's. Since then it has become an all-purpose phrase questioning the substance of an idea, event or product. The phrase first came to public attention in a U.S. television commercial for the Wendy's chain of hamburger restaurants in 1984. In reality, the strategy behind the campaign was to distinguish competitors (McDonald's and Burger King) big name sandwiches (Big Mac and Whopper respectively) from Wendy's 'modest' Single by focusing on the large bun used by the competitors and the larger beef patty in Wendy's sandwich. In the ad, titled "Fluffy Bun," actress Clara Peller receives a burger with a massive bun from a fictional competitor, which uses the slogan "Home of the Big Bun". The small patty prompts Peller to angrily exclaim, "Where's the beef?" An earlier version, featuring a middle-aged bald man saying, "Thanks, but where's the beef? ", failed to make much impact. After the Peller version, the catchphrase was repeated in television shows, films, magazines, and other media outlets. First airing on January 10, 1984, the original commercial featured three elderly ladies at the "Home of the Big Bun" examining an exaggeratedly large hamburger bun. The other two ladies poked at it, exchanging bemused comments ("It certainly is a big bun. It's a very big bun. It's a big fluffy bun. It's a very big fluffy—"). As one of the ladies lift the top half of the bun, a comically minuscule hamburger patty with cheese and a pickle is revealed (prompting her to finish the sentence "—bun." with a much more disappointed tone). Peller immediately responds with her outraged, irascible question. Sequels featured Peller yelling at a Fluffy Bun executive from his yacht over the phone and approaching fast food drive-up windows (including the "Home of the Big Bun" and one with a golden arch) that were slammed down before she could complete the line. People atop the Berlin Wall near the Brandenburg Gate on 9 November 1989. Mohammad Reza Shah Pahlavi; was the Shah of Iran from 16 September 1941 until his overthrow by the Iranian Revolution on 11 February 1979. He took the title Shāhanshāh ("Emperor" or "King of Kings") on 26 October 1967. 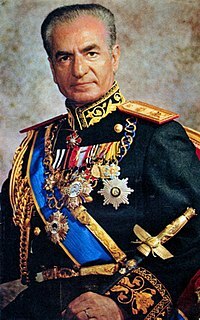 He was the second and last monarch of the House of Pahlavi of the Iranian monarchy. Mohammad Reza Shah Pahlavi held several other titles, including that of Āryāmehr (Light of the Aryans) and Bozorg Arteshtārān (Head of the Warriors). Mohammad Reza Pahlavi came to power during World War II after an Anglo-Soviet invasion forced the abdication of his father, Reza Shah. During Mohammad Reza's reign, the Iranian oil industry was briefly nationalized, under the democratically elected Prime Minister Mohammad Mosaddegh, until a US and UK-backed coup d'état deposed Mosaddegh and brought back foreign oil firms. Iran marked the anniversary of 2,500 years of continuous monarchy since the founding of the Persian Empire by Cyrus the Great during his reign, at which time he also changed the benchmark of the Iranian calendar from the hegira to the beginning of the Persian Empire, measured from Cyrus the Great's coronation. As ruler, he introduced the White Revolution, a series of economic, social and political reforms with the proclaimed intention of transforming Iran into a global power and modernising the nation by nationalising certain industries and granting women suffrage. ...that Phillip Glass' Akhnaten had its world premiere on March 24, 1984 ?